According to a recent National Education Association's Reading at Risk study, 15 million Americans have attempted some kind of "creative writing". Very few of these writers have had their work successfully published. Are you one of them? Want to know how you can improve your chances? 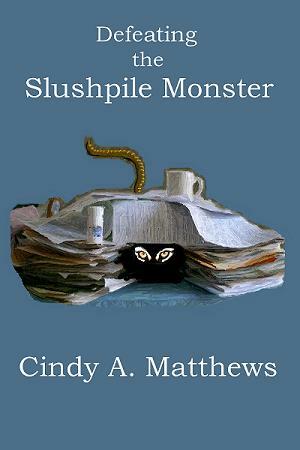 You can find the answers in my funny guide for serious writers, Defeating the Slushpile Monster. Laugh while you learn how you can improve your manuscript's chances of surviving the arduous submission process. Find out how "Only You Can Prevent Formatting Follies" and how to avoid those "Prose Pile-Ups on Publication Road"
Read an excerpt from Defeating the Slushpile Monster by clicking here. The biggest inspiration I had for writing Defeating the Slushpile Monster was the desire to give out some inside tips to help writers increase their chances of getting their manuscripts seriously considered by publishing professionals. I know when I started submitting my novels I was often discouraged by the entire process. (And, to be honest, I'm still am.) It seemed to me that many editors and agents never read beyond the first few pages or chapters of my manuscript before making a judgment. How could I get them to at least consider the whole she-bang? It wasn't until after I took a job reading manuscripts for an editorial listing service that I started noticing a similar pattern in rejected manuscripts. These relatively small (yet powerful) handful of problems kept popping up over and over again. I thought, "If only people knew what to avoid, what to look out for, and how to improve their manuscripts how much more successful they could be." It may sound like I'm pursuing a noble cause, but in reality I'm not. I'm basically selfish. I don't want to continue rejecting the majority of manuscripts I read in the future. It's no fun. I want to see writers succeed so I—and the rest of the world—can enjoy the fruit of their creativity. I mean, it really hurts to have to reject a potentially good story and great characters if the author simply can't follow submission guidelines. Can you describe some “inside tips” that can increase the chances of a manuscript’s success? The number one truth I've learned over the years is that publishing professionals are very busy people. The main reason they read only a few pages is that the writer hasn't "hooked" them in those important first pages. It’s the writer’s job to inspire confidence in his/her story-telling craft, otherwise the sheer volume of the slush pile is working against that book. For an editor or agent there are always other manuscripts to consider—and toss. Cruel but true. The writer’s goal is to create a story that the reader can’t put down, especially early on in the manuscript, and to keep folks turning pages late into the night. Oftentimes the genesis of a hook is present in the first draft of a manuscript, but it’s buried under a lot of unnecessary back-story, “information dumps” and sluggish prose. The motto I give writers to tackle this problem is, “When in doubt—leave it out.” Strong self-editing is the key. In your opinion, what is the number one thing that causes an editor to reject a manuscript outright? In all honesty, I believe the number one thing that causes instant rejection is the simple fact that the author has not followed all the publisher’s submission guidelines to the letter—and I’m not just talking about proper font size here. You’d be surprised how many romance editors receive manuscripts that don’t remotely qualify as “romance” and, therefore, the book cannot be published by their house no matter how well written it is. I’m sure other genre editors experience the same phenomenon on a regular basis as well. Along with not presenting a well-written, thoroughly proofed, finished manuscript, I would say submitting a manuscript to the “wrong” editor is the most frequent cause of rejection. Do you believe that anyone can write, submit and publish successfully? Doesn’t it take extensive training or a college degree in English or creative writing? If there’s one profession that doesn’t pull rank and say you must have a license/degree/diploma to practice it, it’s writing. The public would be surprised to know that many of the names on the best-seller lists do not possess more than a high school education. It’s time for people to shake this silly notion that somehow a piece of paper from a university magically gives a person the ability to become a writer. It doesn’t. Always remember that a writer writes. Plain and simple. While studying books on writing, taking writing courses, attending workshops and talking with published authors all help, unless a person is willing to sit down at the keyboard on a regular basis and type about 100,000 “throw-away” words for every one hundred “keepers”, he/she may want to re-think his/her goal of becoming a writer. Like playing a musical instrument, writing takes practice. A lot of practice. Many people have genuine musical talent but never pursue music because they hate to practice. If an individual has the drive to write and write some more—and then risk possible rejection in the submission process—then I guarantee, with or without a college degree, some day this writer will see his/her words in print. What about “Manuscript-eating Slush Pile Monsters”? Do they really exist? Of course. How else do you explain why the vast majority of submissions fall victim to rejection? Seriously, that’s what Defeating the Slushpile Monster is all about—taking responsibility for creating the best manuscript possible before sending it out to fight for its life in the towering slush piles of the publishing world. The tips and examples I give are easy to follow and, perhaps, even a little on the silly side at times. I know from personal experience that writing and submitting can be a lonely and stressful business. A little humor never hurts. I sincerely hope that armed with the knowledge in Defeating the Slushpile Monster the "slushpile monsters" will never haunt anyone’s writing desk ever again.